Whenever I check the keywords that have been used on various search engines by viewers that have been guided to my blog site, “embedded ball” is always towards the top of the list. I therefore deduce that many golfers do not fully understand this area of the Rules and resort to Internet search engines for help. As we approach the time of year where those of us living in the Northern Hemisphere have begun to encounter embedded balls, both on and off the fairway, I think that it is timely for me to write on this subject again. In this previous blog I answered the most commonly asked questions on embedded balls. A ball embedded in its own pitch-mark in the ground in any closely mown area through the green may be lifted, cleaned and dropped, without penalty, as near as possible to the spot where it lay but not nearer the hole. The ball when dropped must first strike a part of the course through the green. “Closely mown area” means any area of the course, including paths through the rough, cut to fairway height or less. "The USGA also adopts (and recommends the universal adoption of) the Local Rule for Embedded Balls Through the Green. This Local Rule, in Appendix I; Part B; Section 3a, entitles players to relief without penalty for a ball embedded in its own pitch-mark anywhere through the green (as opposed to Rule 25-2 which is applicable only in closely mown areas through the green)." The USGA’s and R&A’s recommended wording for such a Local Rule is contained in Appendix I, Part B, 4 of the Rules of Golf. Don’t forget to familiarise yourself with the Local Rules in operation before commencing any competitive round of golf. If you don’t want to miss any of my weekly blogs and you are not already receiving them by email, just enter your address at the top right of the home page. There is no charge, you may unsubscribe at any time and I do not share your details with anyone. Dear Barry, the rule for me was clear - till the Abu Dhabi Open (where obviously the players were allowed to lift an embedded ball through the green) when Tiger got 2 strokes penalty for lifting an embedded ball, because under the plants in the rough there was sand. Are there definitions for the ground? Where? And where ends "sand" and where starts "earth" where you are allowed to drop? I recommend that you check out my current blog on the Tiger Woods embedded ball incident, where I have provided full details on the reason why the penalty was correctly imposed. From Decision 25-2/0.5; "For a ball to be considered embedded, it must be in its own pitch-mark with part of the ball below the level of the ground." From the overhead photo on my blog (dated January 18th 2013) indicating where Tiger had driven his ball, you will clearly see that it was in an area of sand. Both he and Martin Kaymer agreed that it was embedded in sand. This was unfortunate, as Tiger would not have incurred the penalty if the ball was not embedded and he had played it as it lay. Given the terrible weather over the last few years - particularly in the summer, my club is considering introducing a "permanent" local rule to extend the embedded ball rule "through the green". We would intend to print it on our score cards. Can you advise whether this is possible/acceptable? I'm sure I read somewhere that ALL major golf tours now have such a local rule covering ALL of their events. I found the following relating to the European Tour on an obscure Italian website http://www.regolegolf.com/cms/fileadmin/docs/rules/hc/PGAETHardCard2012_EN_rg.pdf. My club pro tells me that this applies to all the events he plays in. Did you read the article above? It includes this quote, "The USGA also adopts (and recommends the universal adoption of) the Local Rule for Embedded Balls Through the Green". So, yes it is permissible to introduce such a permanent Local Rule, anywhere in the world. Sorry if I'm being a bit dim but I can't see why the extract you quote about the USGA means that we can have a permanent local rule on EBs at our club in the UK. In fact the extract from the R&A Guidance on Running a Comp seems to suggest that any local EB rule can only be temporary and must be withdrawn when conditions warrant. If we are allowed to have a permanent local rule then why can't we print it on our scorecard? I do see your point. However, the Rules of Golf are unified across the world. 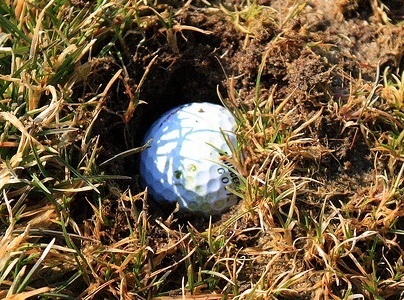 Whilst the USGA and R&A disagree over whether balls embedded through the green should be permitted at all times, there is no doubt that a Committee may introduce a Local Rule in this respect. The USGA encourage it, whilst the R&A would prefer that it was only introduced on a temporary basis. The R&A's publication, 'Guide to Running a Competition', does not form part of the Rules and therefore your Committee can make it a permanent Local Rule and print it on the score card, if they really think that this is warranted by poor course conditions through the seasons. Could you please comment on the following situation? 2 players in a match tee off on the 7th hole. Player A watches his ball land on edge of fairway and plug. Upon arriving to the area where his ball landed, both players cannot locate the ball. What is the procedure? The only way to proceed when a ball cannot be found and no provisional ball has been played, is to go back to where the ball was last played from under penalty of stroke and distance, Rule 27-1.
a player was given relief for a embedded ball in rough before a green under supervision of rules official. Unfortunately I could not remember details. Wera a local rule in place for rule 25-2?? I do not know definitively, but as the Rules Official gave the player relief I have to assume that there was a Local Rule in place permitting relief for a ball embedded through the green. It is my understanding that this is a standard US Tour events.